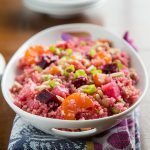 In the winter, I suddenly find all of my favorite fruit desserts—smoothies, sorbets, frozen yogurts—completely unappealing; just the thought makes my teeth hurt and makes me want to curl up in a blanket. 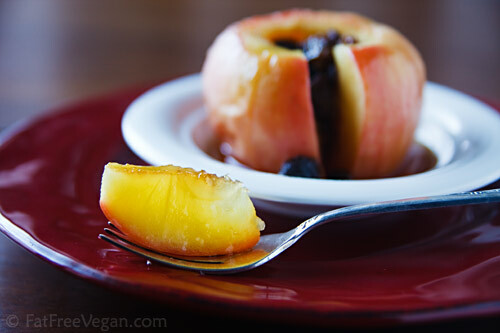 So besides just eating fruit as nature intended, well-rinsed and with a napkin to catch all the juices, I rely on a few simple recipes to transform plain fruit into warm, healthy desserts. 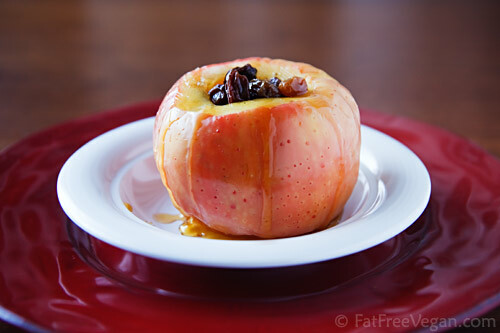 Of these, nothing is simpler or easier than apples baked in the microwave. I’ve been baking apples in the microwave ever since I saw the recipe in Adventures in Microwave Cooking, the book that came with my first Montgomery Ward microwave. (Yes, I just needlessly dated myself.) The original recipe called for only three ingredients besides apples: cinnamon, brown sugar, and butter. Over the years I’ve found that only the cinnamon is necessary; there are better-tasting sweeteners than brown sugar and absolutely no reason to use butter or margarine. My standard recipe contains raisins, cinnamon, maple or date syrup, and sometimes chopped nuts, but lately I’ve come to love filling the apples with frozen berries, especially blueberries. Using frozen rather than fresh ensures that the berries won’t become overcooked before the apple is done. 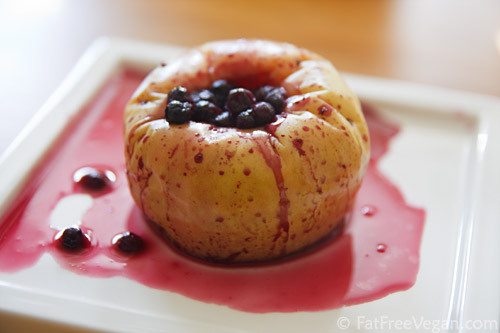 To retain juices and keep the apple as moist as possible, I remove most of the core from the apple, creating a cavity but leaving the bottom intact; the aroma and flavor of the berries permeates the apple from the inside out. My favorite apples for baking are the same as my favorite for eating, Honeycrisp, which are very sweet and hold their shape well when cooked. Granny Smiths are too tart, and other red apples I’ve tried dissolve too easily into mush. If you can’t find Honeycrisp, use the crispest type of apple you can find. And remember, microwaves vary in strength, so you may have to experiment to find the time that is right for yours. 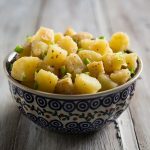 But when your experiments fill your kitchen with the scent of apples and cinnamon and you get to sit down to a sweet, tender baked apple in a matter of minutes, you probably won’t mind testing a few apples to get it just right. To cook more than one apple at a time, increase the cooking time by about 1 minute per extra apple. And remember, microwaves vary so yours may take a little less or more time. Place raisins in a heat-proof bowl and pour boiling water over them. Allow them to soak until plump (time will depend upon the age of your raisins) and remain in soaking liquid until you are ready to cook. Wash an apple and remove most of the core, leaving about 1/4-inch at the bottom. Remove a thin strip of peel from around the cavity. 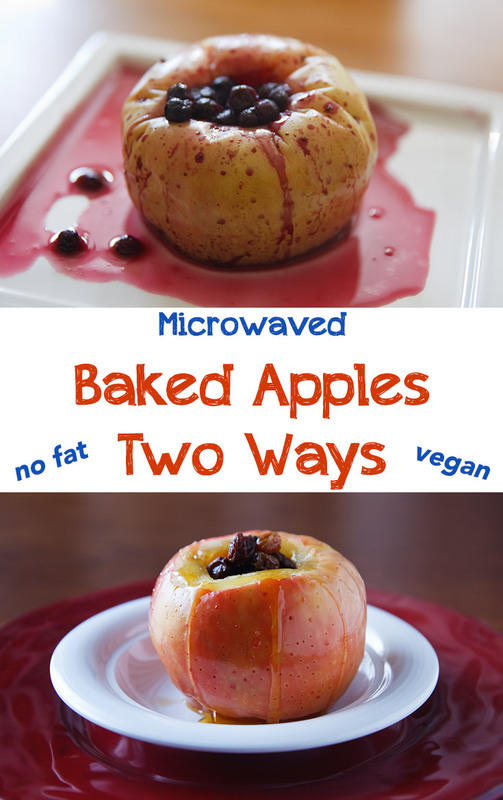 Place the apple into a deep microwave-safe baking dish or bowl. Sprinkle the inside with a little cinnamon and fill with drained raisins. Pour a teaspoon of the soaking water over the raisins and drizzle the syrup over the raisins and top of the apple. 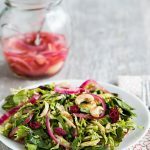 Variation: Add chopped pecans or walnuts along with raisins. Wash an apple and remove most of the core, leaving about 1/4-inch at the bottom. Remove a thin strip of peel from around the cavity. 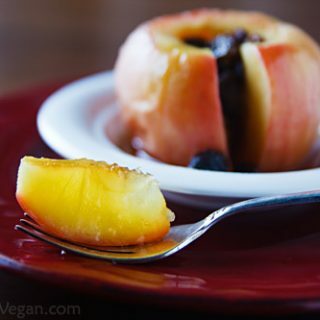 Place the apple into a deep microwave-safe baking dish or bowl. 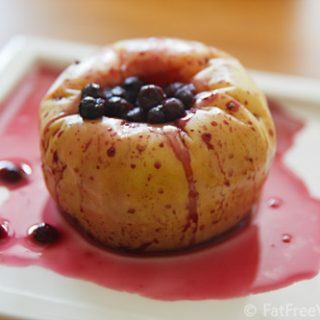 Sprinkle the inside with a little cinnamon and fill with frozen blueberries. Drizzle the syrup over the filling and top of the apple. 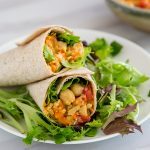 Note: You can cook these in the microwave in about 5 minutes, but if that’s not an option, place them in a baking dish, add enough water to cover the bottom, and bake at 375F for about 45 minutes. Thanks for this recipe. I wasn’t sure if I needed to add extra liquid. I did five small apples together for 10 minutes in the microwave. I’m going to share this with my granddaughter. Thank you for reminding me what a lovely autumn pudding these make. My brother was visiting at Halloween so we had baked apples with lemon and sultanas- delicious. I made the cinnamon version for dinner dessert last night. I haven’t had any sugar/sweetners since New Year’s Eve, so I omitted the agave nectar figuring that I could add it at the end if necessary. My honeycrisp apples are so sweet, that this tasted as sugary and syrupy as a cinnamon roll to me. I can’t wait to try the berry version. I’ve got raspberries and blueberries in the freezer. I just tried the raisin version on a snowy, grey, cold day here in Britain and it was just the job for an after-lunch treat. If I were to use the oven instead of “microwave” to bake apples, what would be the procedure, and for how long would I bake the apples? It’s been so long since I’ve baked apples (silly me! ), thanks for taking the time to answer this silly question! Oh wow. I need to share my breakfast. I’ve been fancying a baked apple for a while but the oven one seems so long and having to deal with pans. Thats when I stumbled across this recipe. I got excited, and got up to make it for breakfast. But I did adapt. I soaked 15g of raisens in a mug with quite a bit of boiled water, cored the apple all the way through and placed in a bowl I added a good pinch of cinnamon then the raisens and pour a bit of the raisen water over the apple. Cooked in the microwave for about five mins. I chopped it all up. Added 25g of plan oats and soaked with the rest of the water, let it cooled down for a few mins and enjoyed. Yum.